Moe Sport Shops and Underground Printing have teamed up with The Big House Big Heart Run. and are offering a special deal for MBN readers. Thanks to our relationship with Moe's/UGP, they have offered to sponsor a reader of this blog who would like to participate in this great event. The one chosen to be sponsored with have their $36 entry fee taken care of by the good folks at Moe's/UGP. I don't really know the best way to decide who should be sponsored. So I think the fairest way is to just have a little contest. So if you're going to be taking part in this great event and would like to participate in this contest, all you have to do is predict the total amount of points that will be scored in tomorrow's game between Michigan and Bowling Green. Just leave your prediction in the comments area of this post. Don't forget, you must predict the total amount of points scored between both teams in the game. The details of the event are below. The winner will be contacted by me, and we'll get you in touch with the sponsor to make sure all of the details are handled. 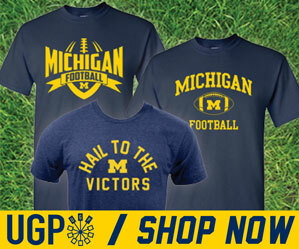 ...starts and finishes at the University of Michigan’s famous football stadium--The Big House. It is the largest stadium in the country seating over 107,000 spectators. This chip-timed 5K and 10K events start on the corner of Kipke and Green and the run takes you through the University of Michigan’s beautiful campus with a spectacular finish--a run through the Big House tunnel and onto the field. You’ll finish on the 50 yard line and watch yourself on the Big House Big Screen! WALKERS, STROLLERS and WHEELCHAIRS WELCOME! Raise Funds for Your Non Profit! Big House Big Heart offers you TWO ways to raise funds for area non profits. Champions for Charity will donate a portion of your entry to ALS research at The University of Michigan Program for Neurology Research & Discovery, the UM Cardiovascular Center and to C. S. Mott Children’s Hospital and Women's Hospital!Get a team together for your favorite non profit. Champions for Charity will supply you with a fund-raising kit. You and your team can raise thousands of dollars for the charity of your choice just by getting tax deductible donations for completing your run. Every penny you and your team raises will go directly to your charity of choice.